The Hazelton, ND area has had 2 reports of on-the-ground hail by trained spotters, and has been under severe weather warnings 9 times during the past 12 months. 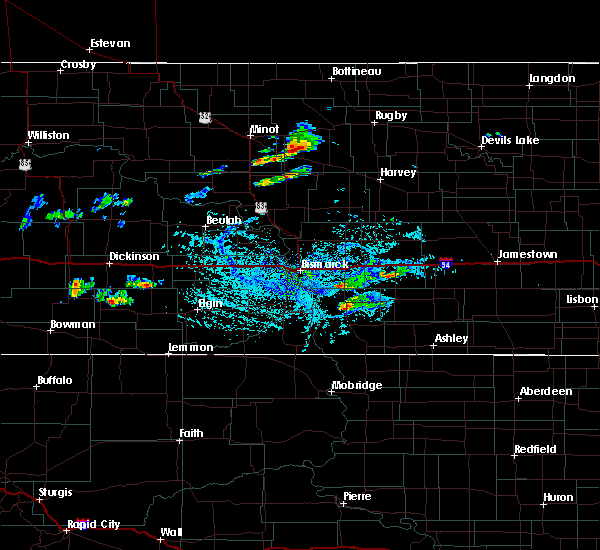 Doppler radar has detected hail at or near Hazelton, ND on 39 occasions, including 7 occasions during the past year. 7/4/2018 12:46 AM CDT At 1246 am cdt, severe thunderstorms were located along a line extending from 6 miles north of braddock to 6 miles east of linton, moving east at 60 mph (radar indicated). Hazards include 60 mph wind gusts. Expect damage to roofs, siding, and trees. These severe thunderstorms will remain over mainly rural areas of western logan and northeastern emmons counties, including the following locations, burnstad, kintyre, beaver lake state park and temvik. 7/3/2018 5:43 AM CDT At 541 am cdt, severe thunderstorms were located along a line extending from near steele to 7 miles southwest of napoleon to 15 miles southeast of braddock to 4 miles southeast of strasburg, moving east at 60 mph. these are very dangerous storms (radar indicated). Hazards include 80 mph wind gusts and quarter size hail. Flying debris will be dangerous to those caught without shelter. mobile homes will be heavily damaged. expect considerable damage to roofs, windows, and vehicles. extensive tree damage and power outages are likely. Locations impacted include, linton, fort yates, selfridge, strasburg, hazelton, menoken, sterling, hague, westfield, cannon ball, braddock, prairie knights resort, mcdowell dam recreation area, driscoll, mckenzie, temvik, and kintyre. 7/3/2018 5:26 AM CDT At 523 am cdt/423 am mdt/, severe thunderstorms were located along a line extending from 5 miles north of sterling to 4 miles southeast of hazelton to 8 miles north of linton to 9 miles east of fort yates, moving east at 60 mph. these are very dangerous storms (radar indicated. 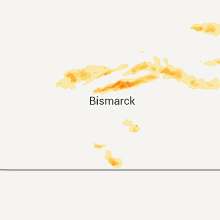 at the bismarck airport a wind gust to 62 mph was observed at 514 am cdt and a gust to 66 mph was observed at the mandan airport). 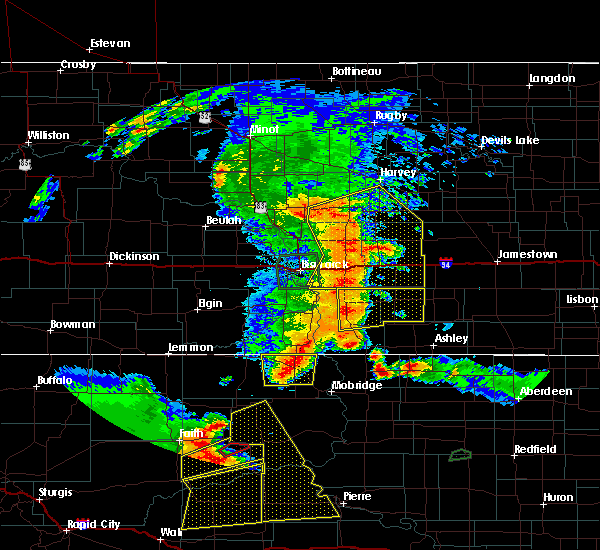 Hazards include 80 mph wind gusts and half dollar size hail. Flying debris will be dangerous to those caught without shelter. mobile homes will be heavily damaged. expect considerable damage to roofs, windows, and vehicles. extensive tree damage and power outages are likely. 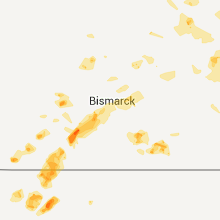 locations impacted include, bismarck, mandan, linton, fort yates, selfridge, lincoln, strasburg, hazelton, menoken, sterling, solen, hague, westfield, cannon ball, braddock, st. Anthony, shields, prairie knights resort, lake harmon and mcdowell dam recreation area. 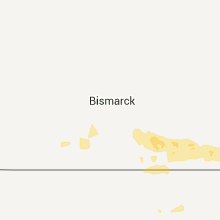 7/3/2018 5:03 AM CDT The national weather service in bismarck has issued a * severe thunderstorm warning for. 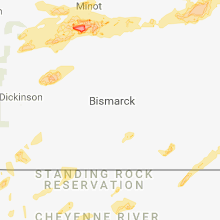 sioux county in south central north dakota. 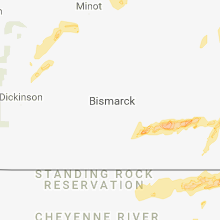 southern burleigh county in south central north dakota. eastern morton county in south central north dakota. Southeastern grant county in south central north dakota. 6/29/2018 1:51 AM CDT At 150 am cdt, severe thunderstorms were located along a line extending from 4 miles northwest of braddock to 6 miles west of linton to 4 miles southeast of selfridge, moving east at 60 mph (radar indicated). Hazards include 60 mph wind gusts. Expect damage to roofs, siding, and trees. these severe storms will be near, linton and braddock around 155 am cdt. strasburg around 200 am cdt. Other locations impacted by these severe thunderstorms include kintyre, temvik, cattail recreation area, beaver bay recreation area and hull. 6/29/2018 1:38 AM CDT At 137 am cdt, severe thunderstorms were located along a line extending from 11 miles northwest of hazelton to prairie knights resort to 7 miles west of selfridge, moving east at 50 mph (radar indicated). Hazards include 60 mph wind gusts. Expect damage to roofs, siding, and trees. 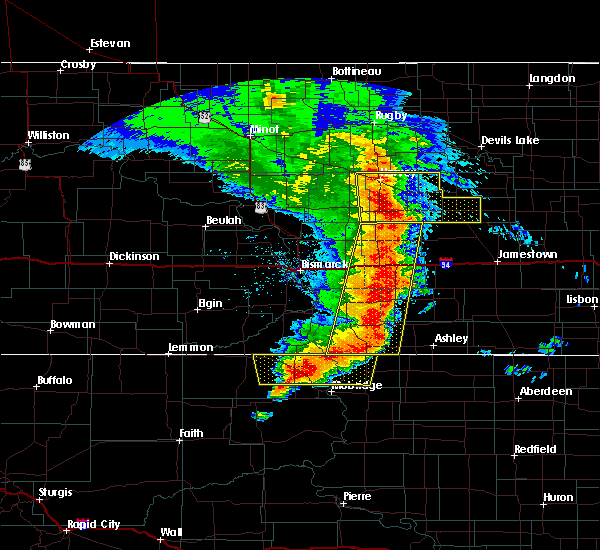 these severe storms will be near, braddock around 155 am cdt. 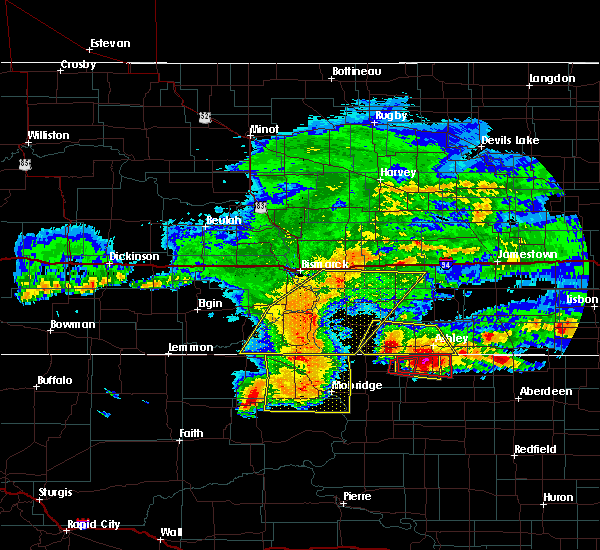 linton around 200 am cdt. 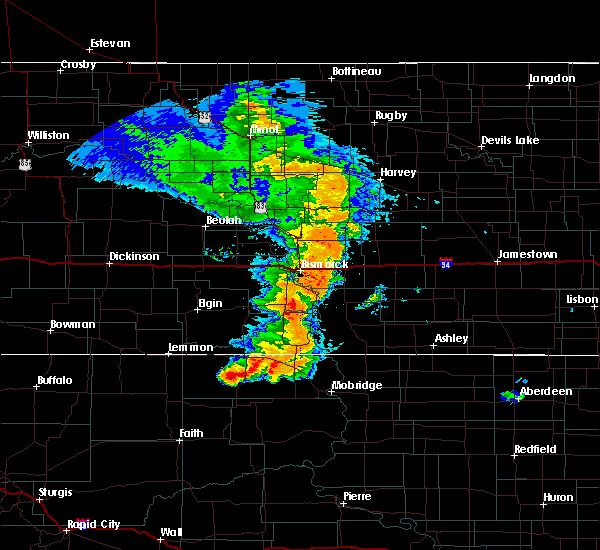 fort yates around 205 am cdt. Other locations impacted by these severe thunderstorms include fort rice, temvik, breien, kintyre, hazelton recreation area, cattail recreation area, beaver bay recreation area, hull and huff. 6/29/2018 1:14 AM CDT At 114 am cdt/1214 am mdt/, severe thunderstorms were located along a line extending from near st. anthony to 6 miles northwest of shields to 10 miles north of keldron, moving southeast at 60 mph (radar indicated). Hazards include 60 mph wind gusts. Expect damage to roofs, siding, and trees. 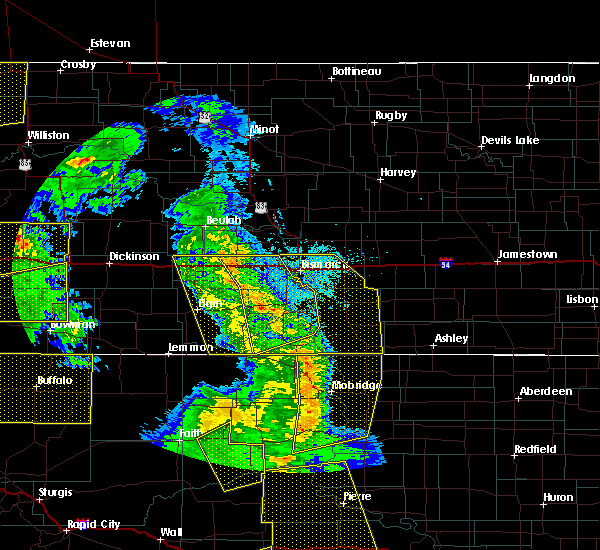 severe thunderstorms will be near, shields and st. anthony around 1220 am mdt. 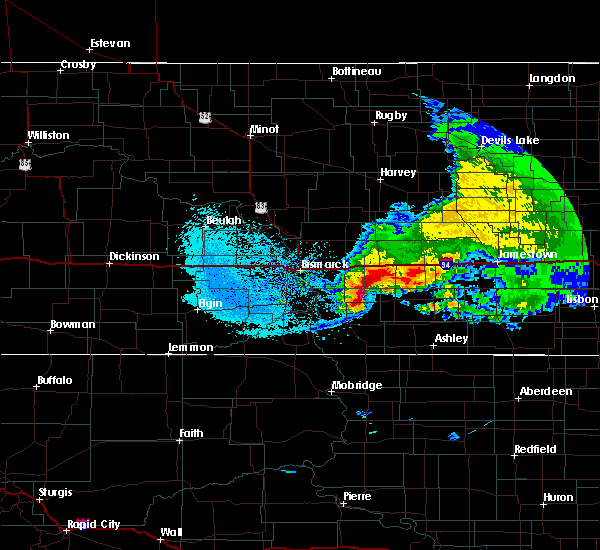 cannon ball around 140 am cdt. 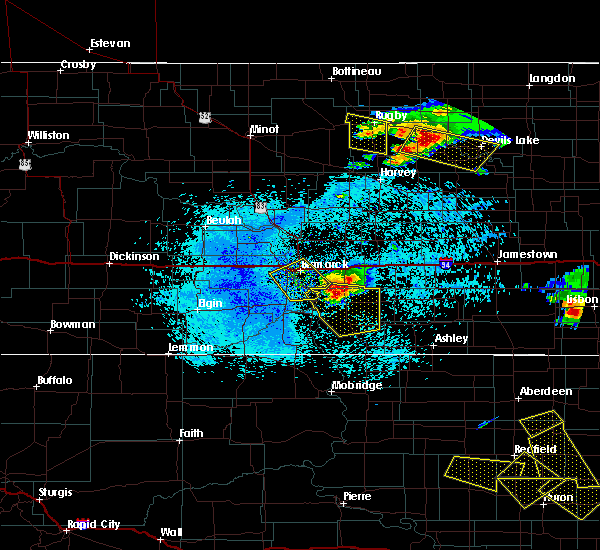 fort yates around 145 am cdt. hazelton around 150 am cdt. westfield around 205 am cdt. hague around 215 am cdt. other locations impacted by these severe thunderstorms include raleigh, temvik, breien, lark, kintyre, hazelton recreation area, hull, huff, st. Gertrude and fort rice. 6/14/2018 9:42 PM CDT At 942 pm cdt, a severe thunderstorm was located over hazelton, or 16 miles north of linton, moving northeast at 45 mph (radar indicated). Hazards include 60 mph wind gusts and quarter size hail. Hail damage to vehicles is expected. expect wind damage to roofs, siding, and trees. this severe storm will be near, braddock around 955 pm cdt. Other locations impacted by this severe thunderstorm include kintyre and temvik. 6/14/2018 9:24 PM CDT At 923 pm cdt, a severe thunderstorm was located 5 miles east of cannon ball, or 14 miles northwest of linton, moving northeast at 45 mph (radar indicated). Hazards include 60 mph wind gusts and quarter size hail. Hail damage to vehicles is expected. expect wind damage to roofs, siding, and trees. 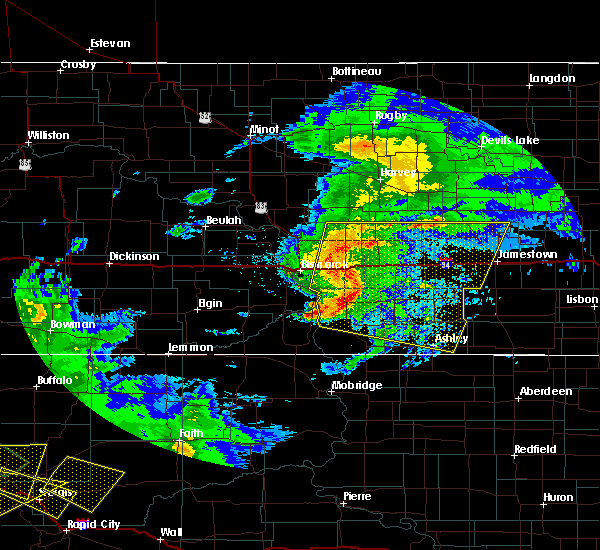 this severe thunderstorm will be near, hazelton around 940 pm cdt. braddock around 955 pm cdt. Other locations impacted by this severe thunderstorm include kintyre and temvik. 7/21/2017 11:38 PM CDT At 1138 pm cdt, a severe thunderstorm was located 8 miles northeast of linton, moving southeast at 35 mph (radar indicated). Hazards include 70 mph wind gusts and quarter size hail. Hail damage to vehicles is expected. expect considerable tree damage. wind damage is also likely to mobile homes, roofs, and outbuildings. This severe thunderstorm will remain over mainly rural areas of southeastern burleigh and northern emmons counties, including the following locations: kintyre and temvik. 7/21/2017 11:15 PM CDT At 1115 pm cdt, a severe thunderstorm was located near hazelton, or 18 miles north of linton, moving southeast at 35 mph (radar indicated). Hazards include golf ball size hail and 70 mph wind gusts. People and animals outdoors will be injured. expect hail damage to roofs, siding, windows, and vehicles. expect considerable tree damage. wind damage is also likely to mobile homes, roofs, and outbuildings. this severe storm will be near, hazelton around 1125 pm cdt. Other locations impacted by this severe thunderstorm include kintyre, hazelton recreation area, fort rice and temvik. 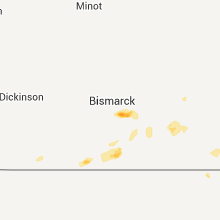 7/21/2017 10:52 PM CDT At 1052 pm cdt, a severe thunderstorm was located 12 miles southeast of lincoln, or 17 miles southeast of bismarck, moving southeast at 35 mph (radar indicated). Hazards include golf ball size hail and 70 mph wind gusts. People and animals outdoors will be injured. expect hail damage to roofs, siding, windows, and vehicles. expect considerable tree damage. wind damage is also likely to mobile homes, roofs, and outbuildings. this severe thunderstorm will be near, hazelton around 1120 pm cdt. linton around 1140 pm cdt. Other locations impacted by this severe thunderstorm include kintyre, hazelton recreation area, fort rice, temvik and huff. 6/27/2017 5:24 PM CDT At 1021 pm cdt, severe thunderstorms were located along a line extending from 4 miles southeast of sterling to 7 miles northwest of linton, moving northeast at 35 mph (radar indicated). Hazards include 60 mph wind gusts and quarter size hail. Hail damage to vehicles is expected. expect wind damage to roofs, siding, and trees. Locations impacted include, hazelton, braddock, driscoll, moffit and temvik. 6/27/2017 4:54 PM CDT At 953 pm cdt, severe thunderstorms were located along a line extending from 13 miles south of menoken to 5 miles southeast of prairie knights resort, moving northeast at 35 mph (radar indicated). Hazards include golf ball size hail and 60 mph wind gusts. People and animals outdoors will be injured. expect hail damage to roofs, siding, windows, and vehicles. Expect wind damage to roofs, siding, and trees. 8/10/2016 12:30 AM CDT At 1228 am cdt, severe thunderstorms were located along a line extending from 7 miles southwest of lake isabel to 6 miles northeast of linton to 5 miles south of hague, moving southeast at 50 mph. 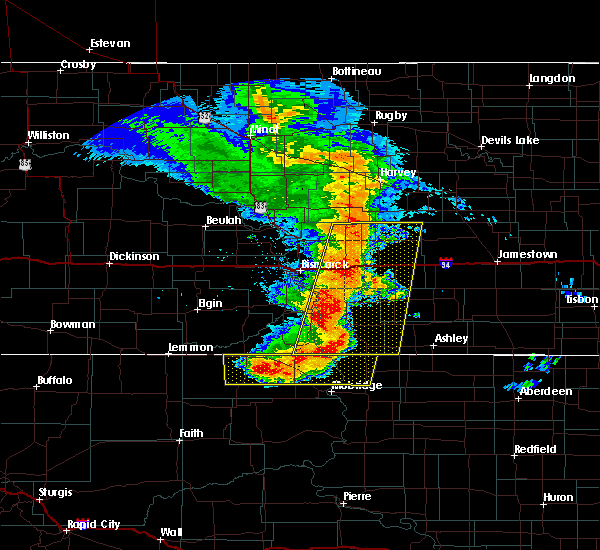 these are very dangerous storms (linton mesonet site reports 74 mph winds). Hazards include 80 mph wind gusts and quarter size hail. Flying debris will be dangerous to those caught without shelter. mobile homes will be heavily damaged. expect considerable damage to roofs, windows, and vehicles. extensive tree damage and power outages are likely. These severe thunderstorms will remain over mainly rural areas of southern kidder, southeastern burleigh, western logan, eastern sioux and emmons counties, including the following locations: cattail recreation area, moffit, kintyre, beaver bay recreation area, temvik and hull. 8/10/2016 12:15 AM CDT At 1215 am cdt, severe thunderstorms were located along a line extending from 7 miles southwest of steele to 8 miles south of hazelton to near pollock, moving east at 45 mph (radar indicated). Hazards include 70 mph wind gusts and quarter size hail. Hail damage to vehicles is expected. expect considerable tree damage. wind damage is also likely to mobile homes, roofs, and outbuildings. these severe storms will be near, westfield around 1220 am cdt. Other locations impacted by these severe thunderstorms include cattail recreation area, moffit, kintyre, fort rice, hazelton recreation area, hull, beaver bay recreation area and temvik. 8/10/2016 12:01 AM CDT At 1201 am cdt, severe thunderstorms were located along a line extending from 7 miles southwest of steele to 4 miles east of cannon ball to 8 miles northwest of kenel, moving east at 40 mph (radar indicated). Hazards include 70 mph wind gusts and quarter size hail. Hail damage to vehicles is expected. expect considerable tree damage. wind damage is also likely to mobile homes, roofs, and outbuildings. these severe storms will be near, linton around 1220 am cdt. Other locations impacted by these severe thunderstorms include cattail recreation area, moffit, kintyre, fort rice, breien, hazelton recreation area, hull, huff, mckenzie and beaver bay recreation area. 8/9/2016 11:43 PM CDT At 1143 pm cdt/1043 pm mdt/, severe thunderstorms were located along a line extending from near sterling to near solen to 7 miles south of selfridge, moving southeast at 45 mph (radar indicated). Hazards include 60 mph wind gusts and quarter size hail. Hail damage to vehicles is expected. expect wind damage to roofs, siding, and trees. 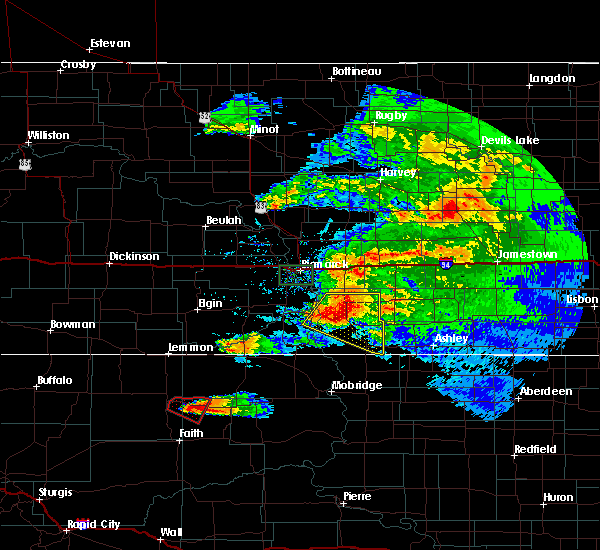 severe thunderstorms will be near, sterling around 1150 pm cdt. linton around 1215 am cdt. strasburg around 1225 am cdt. Other locations impacted by these severe thunderstorms include cattail recreation area, moffit, porcupine, kintyre, fort rice, breien, hazelton recreation area, hull, huff and mckenzie. 7/16/2016 4:47 PM CDT At 446 pm cdt, a severe thunderstorm was located over cannon ball, or 18 miles northwest of linton, moving east at 25 mph (radar indicated). Hazards include 60 mph wind gusts and quarter size hail. Hail damage to vehicles is expected. expect wind damage to roofs, siding, and trees. this severe storm will be near, hazelton around 515 pm cdt. Other locations impacted by this severe thunderstorm include hazelton recreation area, temvik and fort rice. 7/16/2016 4:35 PM CDT At 434 pm cdt, a severe thunderstorm was located near cannon ball, or 21 miles north of fort yates, moving east at 25 mph (radar indicated). Hazards include 60 mph wind gusts and quarter size hail. Hail damage to vehicles is expected. expect wind damage to roofs, siding, and trees. this severe storm will be near, cannon ball around 445 pm cdt. hazelton around 515 pm cdt. Other locations impacted by this severe thunderstorm include hazelton recreation area, temvik and fort rice. 7/16/2016 4:15 PM CDT At 415 pm cdt, a severe thunderstorm was located over solen, or 24 miles north of fort yates, moving east at 25 mph (radar indicated). Hazards include 60 mph wind gusts and half dollar size hail. Hail damage to vehicles is expected. expect wind damage to roofs, siding, and trees. this severe thunderstorm will be near, cannon ball around 440 pm cdt. hazelton around 515 pm cdt. Other locations impacted by this severe thunderstorm include hazelton recreation area, temvik and fort rice. 7/11/2016 2:20 AM CDT At 220 am cdt, a severe thunderstorm was located 8 miles northwest of linton, moving east at 25 mph (radar indicated). Hazards include 60 mph wind gusts and half dollar size hail. Hail damage to vehicles is expected. expect wind damage to roofs, siding, and trees. 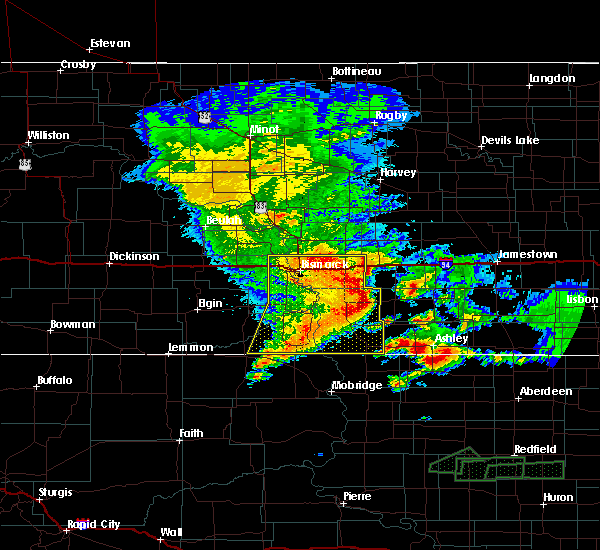 this severe storm will be near, linton around 240 am cdt. Other locations impacted by this severe thunderstorm include beaver bay recreation area, temvik and kintyre. 7/11/2016 2:03 AM CDT At 203 am cdt, a severe thunderstorm was located 7 miles south of hazelton, or 8 miles north of linton, moving northeast at 30 mph (radar indicated). Hazards include 60 mph wind gusts and half dollar size hail. Hail damage to vehicles is expected. expect wind damage to roofs, siding, and trees. 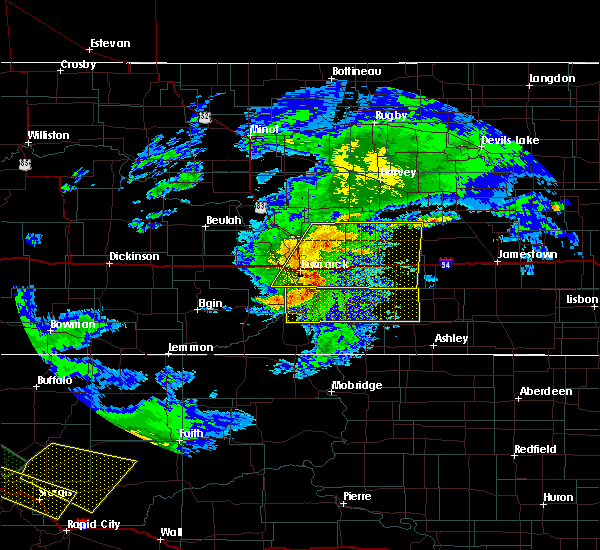 this severe storm will be near, hazelton around 215 am cdt. braddock around 235 am cdt. Other locations impacted by this severe thunderstorm include beaver bay recreation area, temvik and kintyre. 7/11/2016 1:50 AM CDT At 149 am cdt, a severe thunderstorm was located 8 miles west of linton, moving northeast at 25 mph (radar indicated). Hazards include 60 mph wind gusts and half dollar size hail. Hail damage to vehicles is expected. expect wind damage to roofs, siding, and trees. 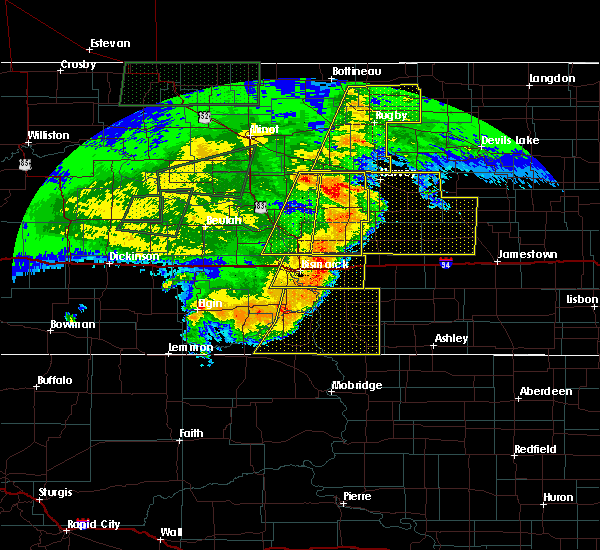 this severe thunderstorm will be near, linton around 210 am cdt. braddock around 245 am cdt. Other locations impacted by this severe thunderstorm include beaver bay recreation area, temvik and kintyre. 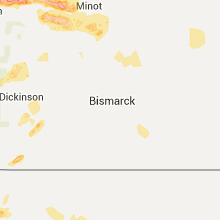 7/10/2016 10:17 PM CDT At 1016 pm cdt, severe thunderstorms were located along a line extending from 7 miles north of dawson to 4 miles north of pollock, moving east at 25 mph (radar indicated). Hazards include 60 mph wind gusts and nickel size hail. Expect damage to roofs. siding. and trees. locations impacted include, linton, napoleon, steele, strasburg, hazelton, tappen, zeeland, tuttle, hague, pettibone, dawson, westfield, robinson, braddock, lake isabel, driscoll, lake williams, hull, horsehead lake and moffit. torrential rain is occurring with these storms, and may lead to flooding on streets, creeks, and culverts. Do not drive your vehicle through flooded roadways. 7/10/2016 9:52 PM CDT At 949 pm cdt, severe thunderstorms were located along a line extending from wing to fort yates, moving east at 50 mph (radar indicated). Hazards include 60 mph wind gusts and nickel size hail. Expect damage to roofs. siding. and trees. these severe storms will be near, steele around 955 pm cdt. dawson around 1005 pm cdt. tappen and westfield around 1010 pm cdt. hague around 1020 pm cdt. zeeland around 1030 pm cdt. other locations impacted by these severe thunderstorms include, robinson, steele, sterling, napoleon, temvik and strasburg. 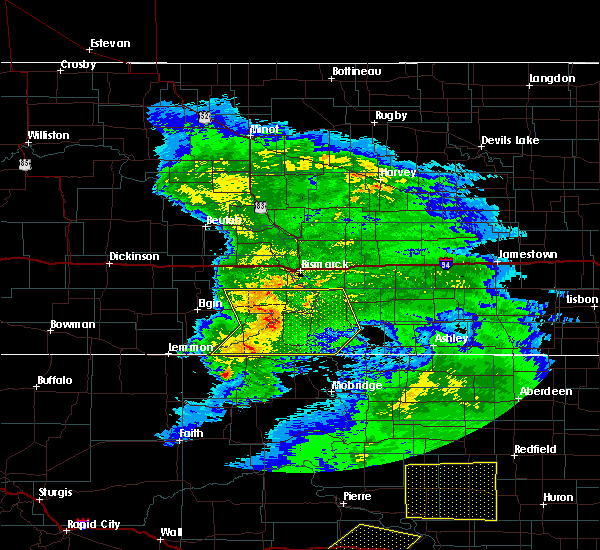 continuous lightning and very heavy rain are also going to occur with these storms. Flooding of streets and ditches will occur. 7/10/2016 9:34 PM CDT At 930 pm cdt, severe thunderstorms were located along a line extending from 10 miles south of wing to 5 miles south of selfridge, moving east at 25 mph (radar indicated). Hazards include 70 mph wind gusts and quarter size hail. Hail damage to vehicles is expected. expect considerable tree damage. wind damage is also likely to mobile homes, roofs, and outbuildings. 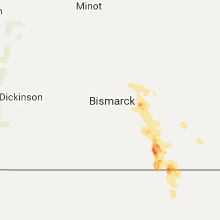 towns in the path of these thunderstorms include, mandan, bismarck, porcupine, fort rice, driscoll, hull, horsehead lake, beaver bay recreation area, moffit kintyre and napoleon. very heavy rain will flood streets and ditches. Do not drive into the water. 7/10/2016 8:56 PM CDT At 855 pm cdt/755 pm mdt/, severe thunderstorms were located along a line extending from 11 miles east of lake harmon to 9 miles northwest of walker, moving east at 40 mph (radar indicated). Hazards include 70 mph wind gusts and quarter size hail. Hail damage to vehicles is expected. expect considerable tree damage. wind damage is also likely to mobile homes, roofs, and outbuildings. these severe storms will be near, selfridge around 915 pm cdt. fort yates around 930 pm cdt. 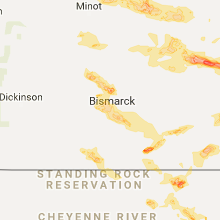 Other locations impacted by these severe thunderstorms include cattail recreation area, porcupine, fort rice, crown butte lake, beaver bay recreation area, double ditch indian village, moffit and fort abraham lincoln state park. 7/10/2016 8:28 PM CDT At 826 pm cdt/726 pm mdt/, severe thunderstorms were located along a line extending from 7 miles west of lake harmon to 5 miles north of watauga, moving east at 40 mph (radar indicated). Hazards include 60 mph wind gusts and quarter size hail. Hail damage to vehicles is expected. expect wind damage to roofs, siding, and trees. 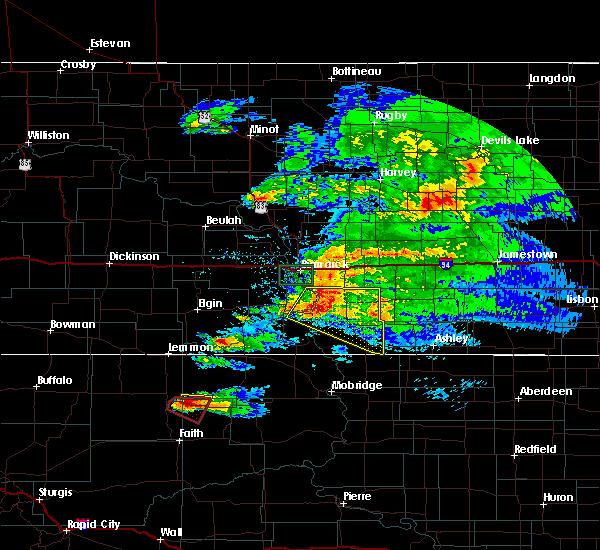 severe thunderstorms will be near, mandan and lake harmon around 835 pm cdt. selfridge around 915 pm cdt. 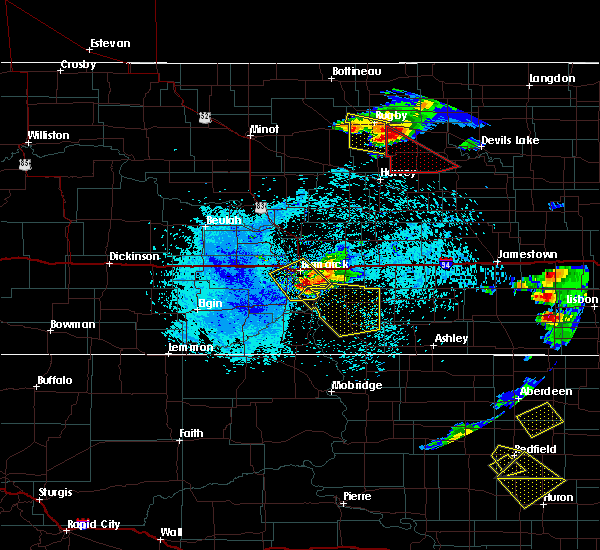 fort yates around 930 pm cdt. other locations impacted by these severe thunderstorms include cattail recreation area, porcupine, sweet briar lake, fort rice, raleigh, judson, driscoll, crown butte lake, lark and beaver bay recreation area. torrential rain is occurring with these storms, and may lead to flooding of streets, creeks, and culverts. Do not drive your vehicle through flooded roadways. 7/6/2016 9:28 PM CDT The severe thunderstorm warning for southeastern grant, sioux, western emmons and southeastern morton counties will expire at 930 pm cdt/830 pm mdt/, the storms which prompted the warning have weakened below severe limits, and no longer pose an immediate threat to life or property. therefore the warning will be allowed to expire. however gusty winds to 55 mph are still possible with these thunderstorms. 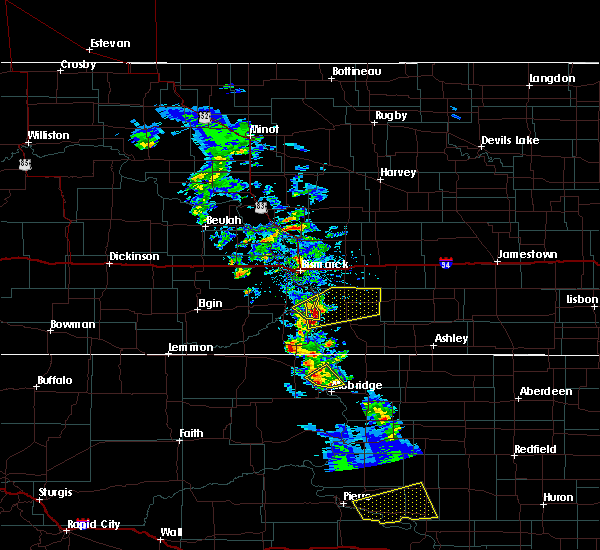 a severe thunderstorm watch remains in effect until 1000 pm cdt/900 pm mdt/ for south central north dakota. 7/6/2016 9:02 PM CDT At 900 pm cdt/800 pm mdt/, severe thunderstorms were located along a line extending from 6 miles north of solen to 4 miles southwest of prairie knights resort to 4 miles south of selfridge, moving east at 40 mph (trained weather spotters). Hazards include 60 mph wind gusts. Expect damage to roofs. siding. and trees. locations impacted include, linton, fort yates, selfridge, hazelton, flasher, solen, cannon ball, prairie knights resort, shields, and st. Anthony. 7/6/2016 8:42 PM CDT At 841 pm cdt/741 pm mdt/, severe thunderstorms were located along a line extending from 7 miles east of flasher to 8 miles east of shields to 7 miles northwest of walker, moving east at 40 mph (trained weather spotters). Hazards include 60 mph wind gusts. Expect damage to roofs. siding. and trees. locations impacted include, linton, fort yates, selfridge, hazelton, flasher, solen, cannon ball, prairie knights resort, shields, st. Anthony, lark, and raleigh. 7/6/2016 8:28 PM CDT At 826 pm cdt/726 pm mdt/, severe thunderstorms were located along a line extending from near flasher to shields to 5 miles north of mcintosh, moving east at 45 mph (trained weather spotters). Hazards include 60 mph wind gusts. Expect damage to roofs. siding. and trees. 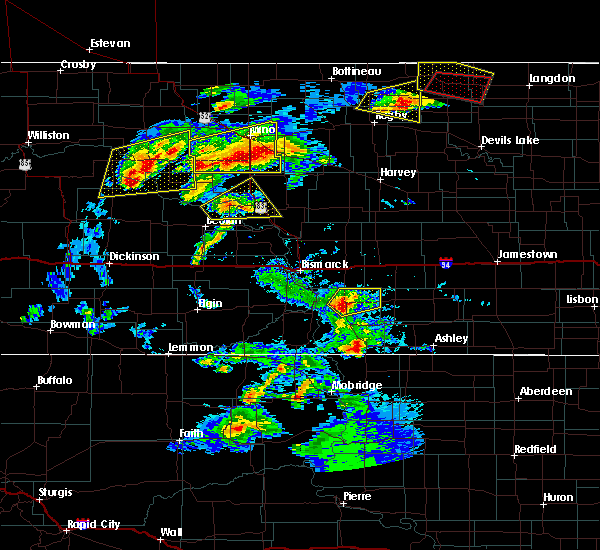 severe thunderstorms will be near, shields around 730 pm mdt. selfridge and solen around 855 pm cdt. 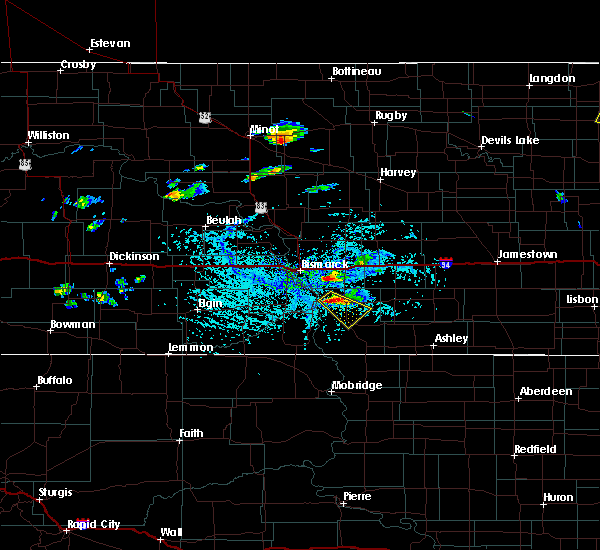 prairie knights resort around 900 pm cdt. 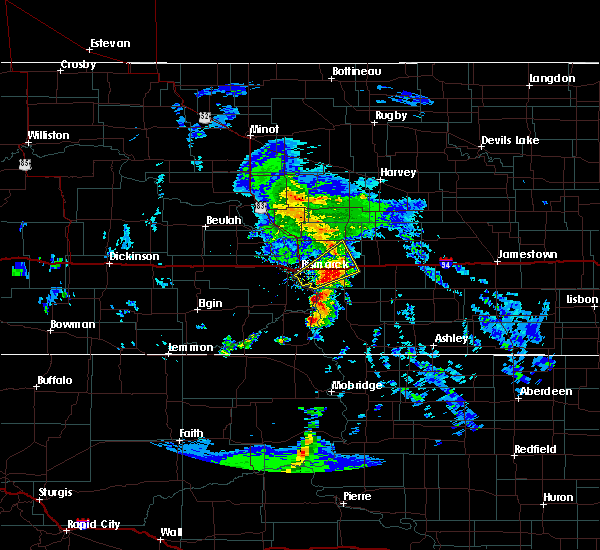 cannon ball around 910 pm cdt. linton and hazelton around 925 pm cdt. Other locations impacted by these severe thunderstorms include cattail recreation area, porcupine, fort rice, raleigh, breien, hazelton recreation area and huff. 6/22/2016 1:32 AM CDT At 131 am cdt, severe thunderstorms were located along a line extending from 10 miles north of napoleon to 7 miles west of linton, moving east at 55 mph (radar indicated). Hazards include 60 mph wind gusts and penny size hail. Expect damage to roofs. siding. and trees. 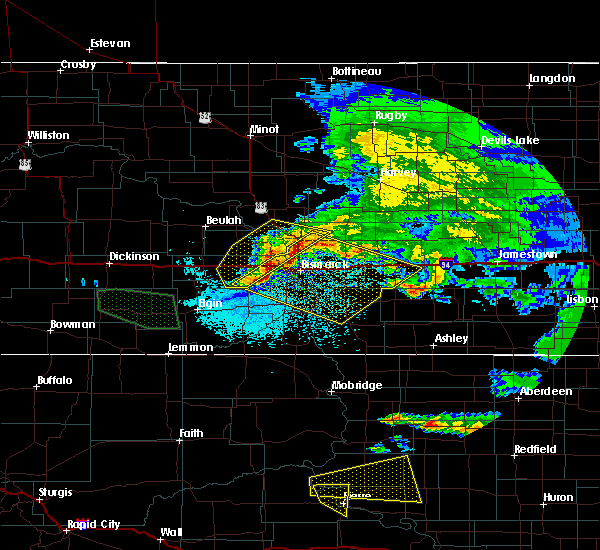 severe thunderstorms will be near, gackle around 205 am cdt. 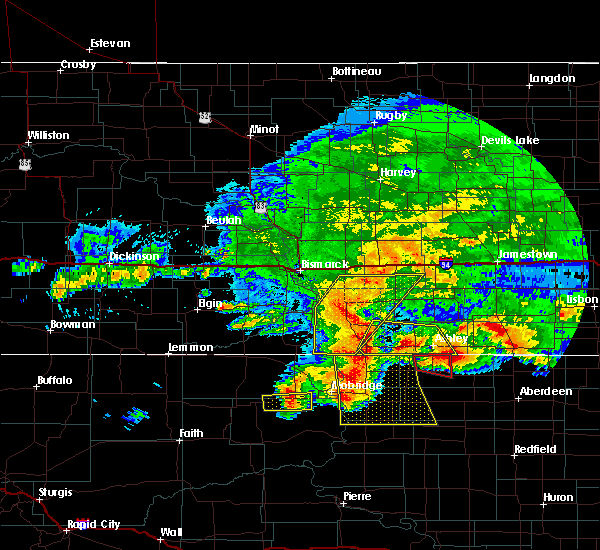 venturia around 220 am cdt. 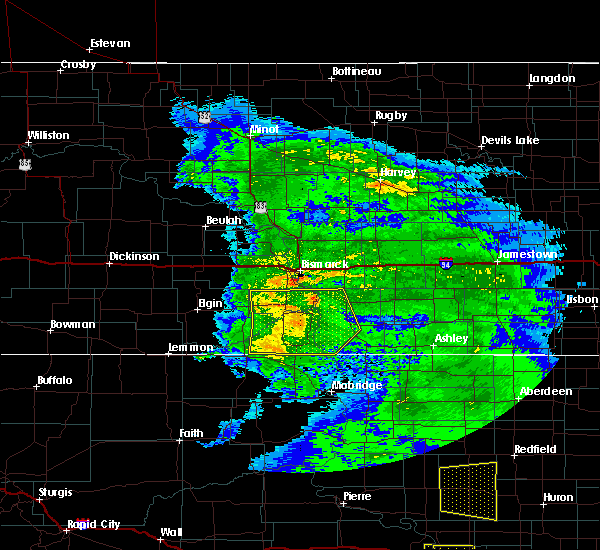 ashley around 225 am cdt. Other locations impacted by these severe thunderstorms include beaver lake state park, kintyre, fredonia, burnstad, danzig, temvik and green lake. 6/22/2016 1:12 AM CDT At 112 am cdt, severe thunderstorms were located along a line extending from 4 miles northwest of steele to 6 miles northwest of cannon ball, moving east at 55 mph (public). Hazards include 70 mph wind gusts and quarter size hail. Hail damage to vehicles is expected. expect considerable tree damage. wind damage is also likely to mobile homes, roofs, and outbuildings. 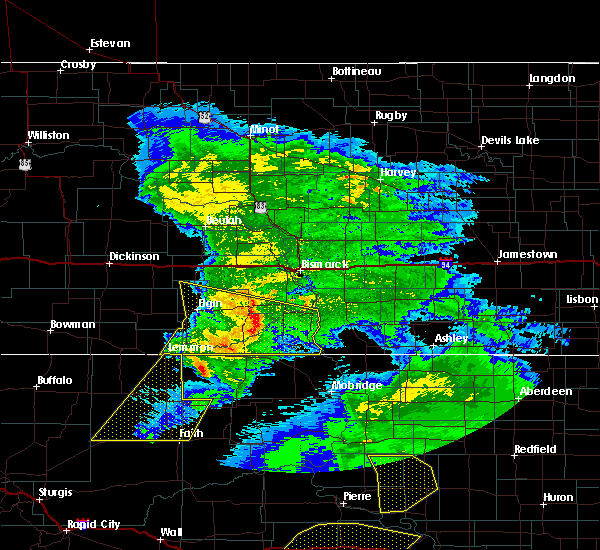 these severe storms will be near, steele around 115 am cdt. dawson and lake isabel around 125 am cdt. 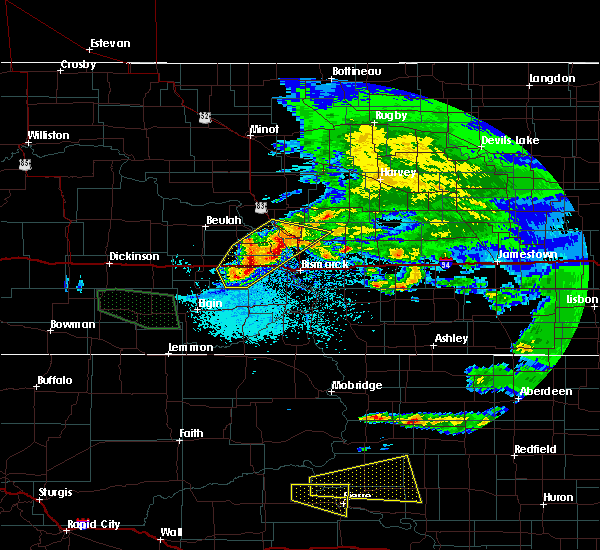 tappen around 130 am cdt. Other locations impacted by these severe thunderstorms include moffit, kintyre, fort rice, hazelton recreation area, driscoll, huff, mckenzie and temvik. 6/22/2016 12:58 AM CDT At 1257 am cdt, severe thunderstorms were located along a line extending from 10 miles north of sterling to 6 miles southwest of st. anthony, moving southeast at 55 mph (public reported 75 mph 6 miles north of bismarck). Hazards include 70 mph wind gusts and quarter size hail. Hail damage to vehicles is expected. expect considerable tree damage. wind damage is also likely to mobile homes, roofs, and outbuildings. these severe storms will be near, steele and cannon ball around 120 am cdt. dawson around 125 am cdt. lake isabel around 130 am cdt. Other locations impacted by these severe thunderstorms include moffit, kintyre, fort abraham lincoln state park, fort rice, hazelton recreation area, driscoll, huff, mckenzie, temvik and university of mary. 6/22/2016 12:40 AM CDT At 1238 am cdt, severe thunderstorms were located along a line extending from 6 miles southwest of regan to 5 miles south of fish creek dam, moving southeast at 45 mph (radar indicated). Hazards include 70 mph wind gusts and quarter size hail. Hail damage to vehicles is expected. expect considerable tree damage. wind damage is also likely to mobile homes, roofs, and outbuildings. 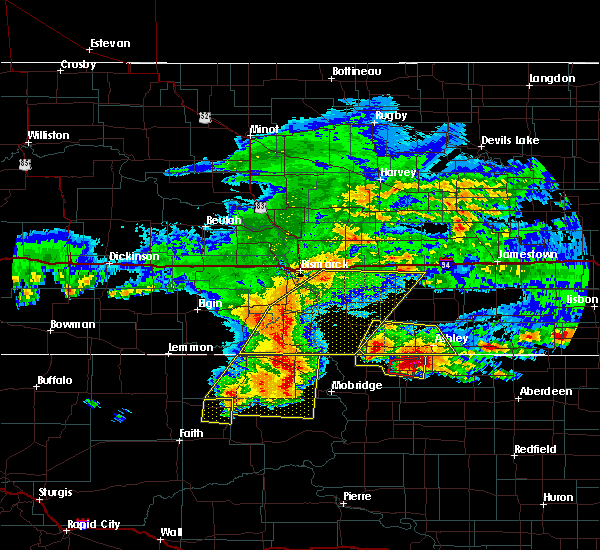 these severe storms will be near, bismarck and mandan around 1245 am cdt. 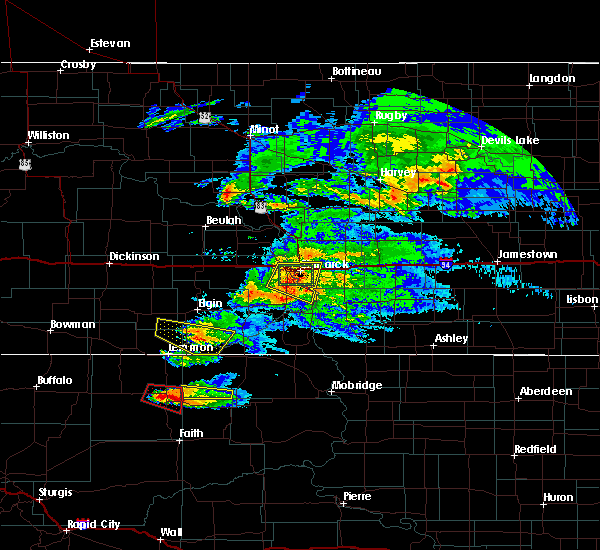 regan around 1245 am cdt. st. anthony around 100 am cdt. steele and cannon ball around 125 am cdt. dawson and lake isabel around 130 am cdt. Other locations impacted by these severe thunderstorms include fort rice, driscoll, crown butte lake, double ditch indian village, kintyre, moffit, fort abraham lincoln state park, baldwin, hazelton recreation area and huff. 6/22/2016 12:30 AM CDT At 1230 am cdt, severe thunderstorms were located along a line extending from 4 miles southeast of wilton to 6 miles southwest of fish creek dam, moving southeast at 45 mph (radar indicated). Hazards include 70 mph wind gusts and quarter size hail. Hail damage to vehicles is expected. expect considerable tree damage. wind damage is also likely to mobile homes, roofs, and outbuildings. 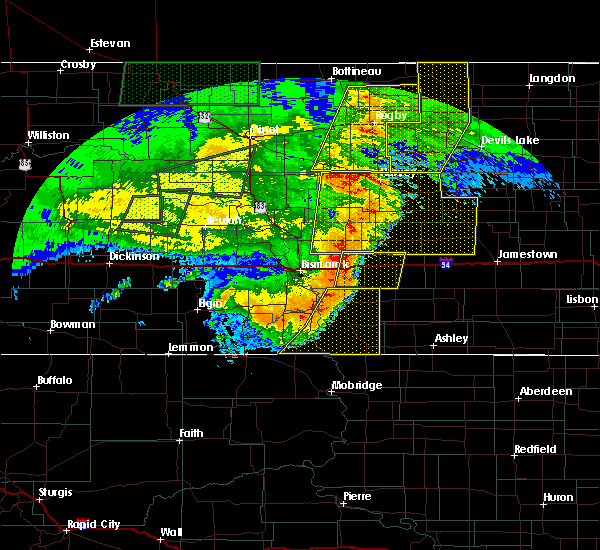 severe thunderstorms will be near, regan around 1240 am cdt. st. anthony around 100 am cdt. steele and cannon ball around 125 am cdt. dawson and lake isabel around 130 am cdt. 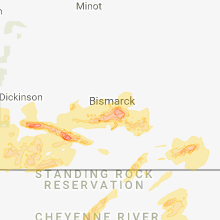 Other locations impacted by these severe thunderstorms include fort rice, driscoll, crown butte lake, double ditch indian village, kintyre, moffit, fort abraham lincoln state park, baldwin, hazelton recreation area and huff. 6/17/2016 4:35 AM CDT At 435 am cdt, severe thunderstorms were located along a line extending from wilton to near menoken to 6 miles northeast of solen, moving east at 50 mph (trained weather spotters. 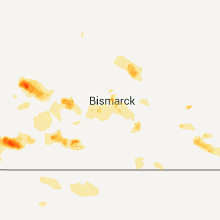 around 430 am cdt...golf ball to two inch diameter hail and 70 mph wind gusts were reported by spotters in north bismarck). Hazards include two inch hail and 70 mph wind gusts. People and animals outdoors will be injured. expect hail damage to roofs, siding, windows, and vehicles. expect considerable tree damage. wind damage is also likely to mobile homes, roofs, and outbuildings. 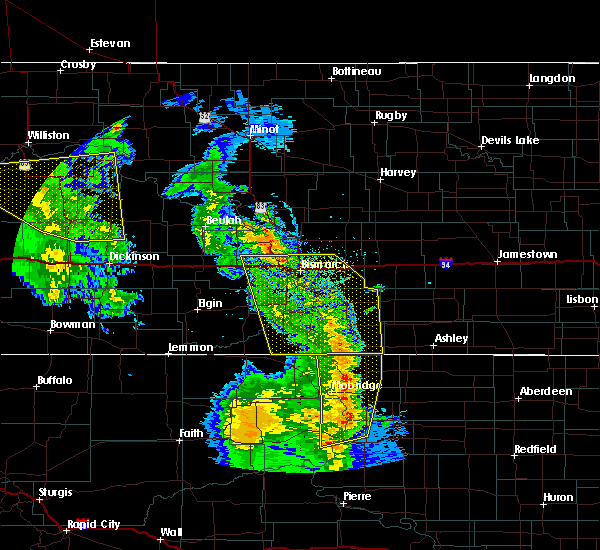 these severe storms will be near, menoken around 440 am cdt. sterling and regan around 450 am cdt. hazelton and wing around 500 am cdt. Other locations impacted by these severe thunderstorms include fort rice, driscoll, crown butte lake, double ditch indian village, moffit, fort abraham lincoln state park, baldwin, hazelton recreation area, nelson lake and arena. 6/17/2016 4:28 AM CDT At 428 am cdt, severe thunderstorms were located along a line extending from 5 miles southwest of wilton to lincoln to 4 miles northwest of solen, moving east at 50 mph (radar indicated. 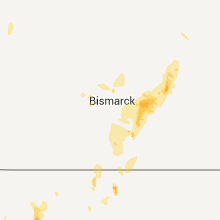 at 423 am cdt...58 mph wind gusts were recorded at the bismarck airport). Hazards include 70 mph wind gusts and half dollar size hail. Hail damage to vehicles is expected. expect considerable tree damage. wind damage is also likely to mobile homes, roofs, and outbuildings. 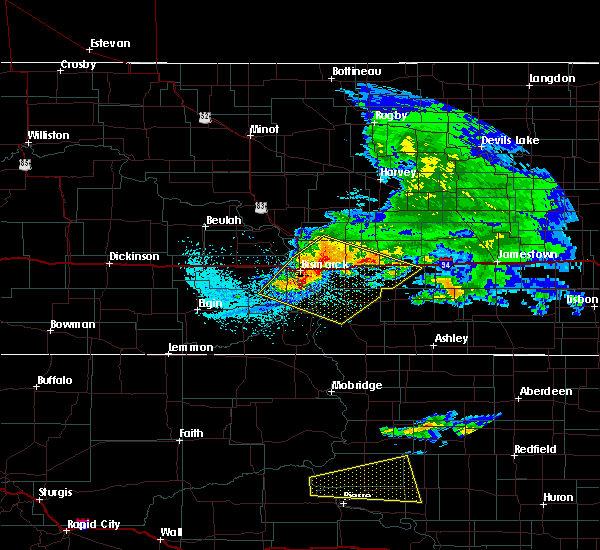 these severe storms will be near, lincoln and mcdowell dam recreation area around 430 am cdt. 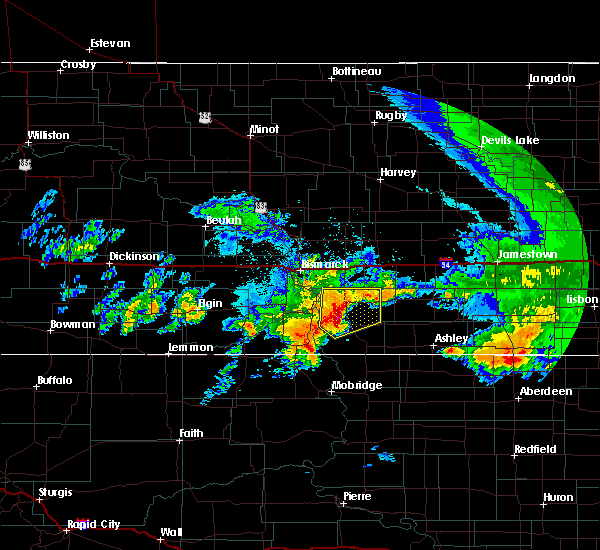 wilton and menoken around 435 am cdt. sterling and regan around 450 am cdt. hazelton and wing around 500 am cdt. 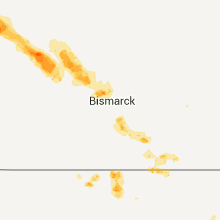 Other locations impacted by these severe thunderstorms include fort rice, driscoll, crown butte lake, double ditch indian village, moffit, fort abraham lincoln state park, baldwin, breien, hazelton recreation area and nelson lake. 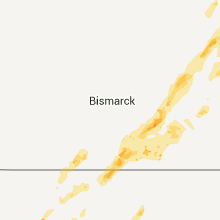 6/17/2016 4:15 AM CDT At 415 am cdt, severe thunderstorms were located along a line extending from 8 miles south of cross ranch state park to 6 miles southwest of bismarck to 9 miles west of solen, moving east at 45 mph (radar indicated). Hazards include 70 mph wind gusts and half dollar size hail. Hail damage to vehicles is expected. expect considerable tree damage. wind damage is also likely to mobile homes, roofs, and outbuildings. 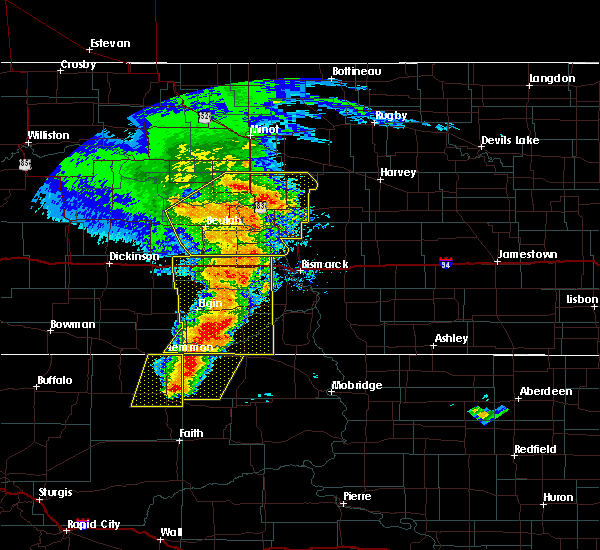 these severe storms will be near, bismarck and lincoln around 425 am cdt. wilton and mcdowell dam recreation area around 430 am cdt. menoken around 435 am cdt. sterling and regan around 450 am cdt. hazelton and wing around 500 am cdt. 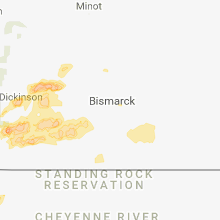 Other locations impacted by these severe thunderstorms include fort rice, driscoll, crown butte lake, double ditch indian village, moffit, fort abraham lincoln state park, baldwin, breien, hazelton recreation area and nelson lake. 6/17/2016 3:58 AM CDT At 358 am cdt, severe thunderstorms were located along a line extending from 4 miles south of center to 7 miles east of fish creek dam to 7 miles south of flasher, moving east at 50 mph (radar indicated). Hazards include 70 mph wind gusts and half dollar size hail. Hail damage to vehicles is expected. expect considerable tree damage. wind damage is also likely to mobile homes, roofs, and outbuildings. 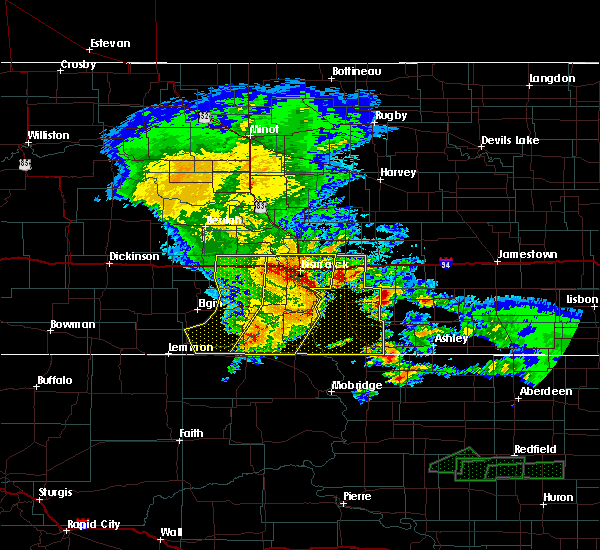 severe thunderstorms will be near, st. anthony around 405 am cdt. 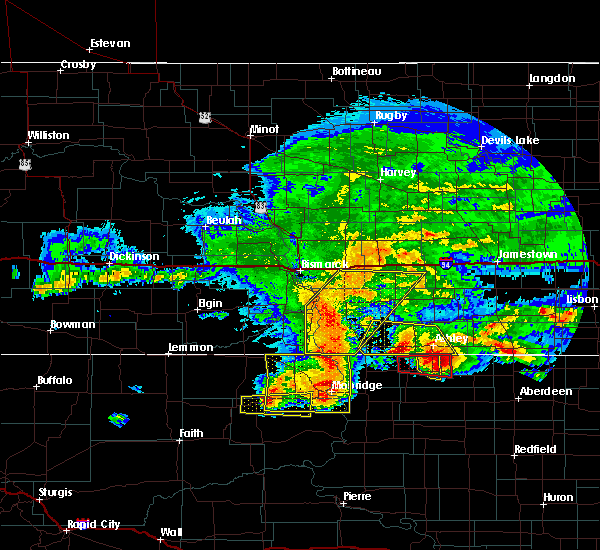 bismarck and lincoln around 420 am cdt. solen and mcdowell dam recreation area around 425 am cdt. 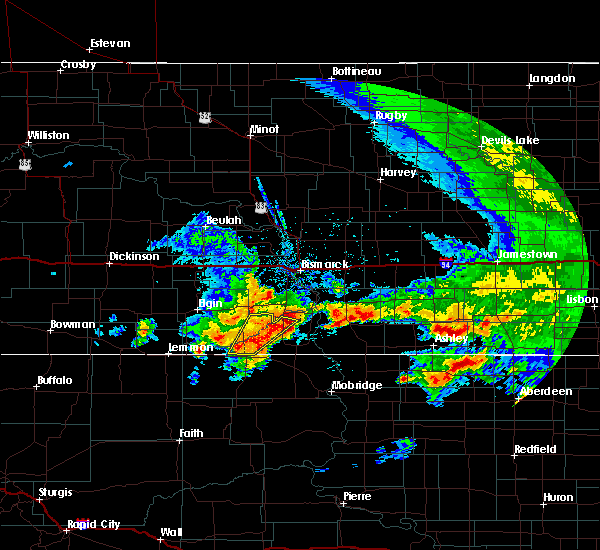 wilton and menoken around 430 am cdt. regan around 440 am cdt. sterling around 445 am cdt. hazelton and wing around 455 am cdt. braddock around 500 am cdt. 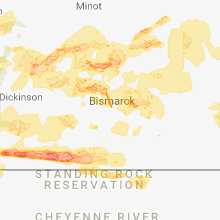 Other locations impacted by these severe thunderstorms include fort rice, driscoll, crown butte lake, double ditch indian village, moffit, fort abraham lincoln state park, baldwin, breien, hazelton recreation area and nelson lake. 5/25/2016 5:58 PM CDT At 557 pm cdt, severe thunderstorms were located along a line extending from 12 miles northwest of hazelton to near linton, moving east at 20 mph. these storms will also effect highway 83 (radar indicated). Hazards include 60 mph wind gusts and quarter size hail. Hail damage to vehicles is expected. expect wind damage to roofs, siding, and trees. Locations impacted include, hazelton, braddock, beaver bay recreation area and temvik. 5/25/2016 5:36 PM CDT At 535 pm cdt, severe thunderstorms were located along a line extending from 11 miles north of cannon ball to 7 miles west of linton, moving northeast at 25 mph (radar indicated). Hazards include 60 mph wind gusts and quarter size hail. Hail damage to vehicles is expected. expect wind damage to roofs, siding, and trees. These severe thunderstorms will remain over mainly rural areas of northeastern sioux, northern emmons and east central morton counties, including the following locations: kintyre, fort rice, beaver bay recreation area, hazelton recreation area and temvik. 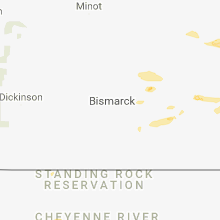 7/27/2015 11:04 PM CDT At 1103 pm cdt, severe thunderstorms were located along a line extending from 7 miles east of lake harmon to 12 miles southeast of menoken to 6 miles northeast of herreid, moving east at 40 mph (radar indicated). Hazards include 60 mph wind gusts. Expect damage to roofs. siding and trees. 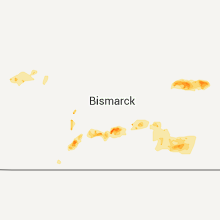 locations impacted include, bismarck, mandan, linton, fort yates, lincoln, strasburg, hazelton, menoken, sterling, solen, hague, westfield, cannon ball, braddock, mcdowell dam recreation area, st. Anthony, lake harmon, prairie knights resort, mckenzie and cattail recreation area. 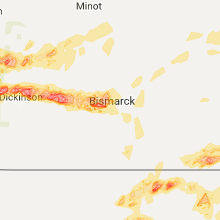 7/27/2015 10:45 PM CDT At 1044 pm cdt /944 pm mdt/, severe thunderstorms were located along a line extending from 4 miles west of lake harmon to 7 miles south of lincoln to near pollock, moving east at 35 mph (radar indicated). Hazards include 60 mph wind gusts. Expect damage to roofs. siding and trees. 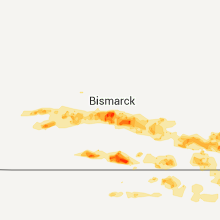 locations impacted include, bismarck, mandan, linton, fort yates, selfridge, lincoln, strasburg, hazelton, menoken, sterling, solen, hague, westfield, cannon ball, braddock, shields, mcdowell dam recreation area, st. Anthony, lake harmon and prairie knights resort. 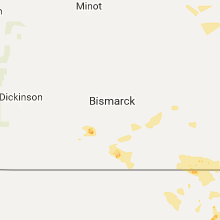 7/27/2015 10:27 PM CDT At 1026 pm cdt /926 pm mdt/, severe thunderstorms were located along a line extending from 10 miles south of center to near st. anthony to 4 miles northeast of kenel, moving east at 40 mph (radar indicated). Hazards include 60 mph wind gusts. Expect damage to roofs. Siding and trees. 7/14/2015 5:29 PM CDT At 529 pm cdt, a severe thunderstorm was located near hazelton, or 11 miles north of linton, moving southeast at 15 mph (radar indicated). Hazards include 60 mph wind gusts and quarter size hail. Hail damage to vehicles is expected. expect wind damage to roofs, siding and trees. this severe storm will be near, linton around 555 pm cdt. Other locations impacted by this severe thunderstorm include temvik. 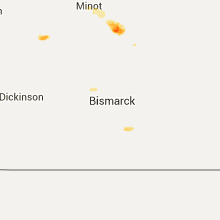 7/14/2015 5:04 PM CDT At 503 pm cdt, a severe thunderstorm was located 8 miles west of hazelton, or 19 miles northwest of linton, moving southeast at 15 mph (radar indicated). Hazards include 60 mph wind gusts and quarter size hail. Hail damage to vehicles is expected. expect wind damage to roofs, siding and trees. this severe thunderstorm will be near, hazelton around 535 pm cdt. Other locations impacted by this severe thunderstorm include temvik. 6/21/2015 9:52 PM CDT At 951 pm cdt, a severe thunderstorm was located over linton, moving southeast at 50 mph (radar indicated). Hazards include 60 mph wind gusts and nickel size hail. Expect damage to roofs. siding and trees. 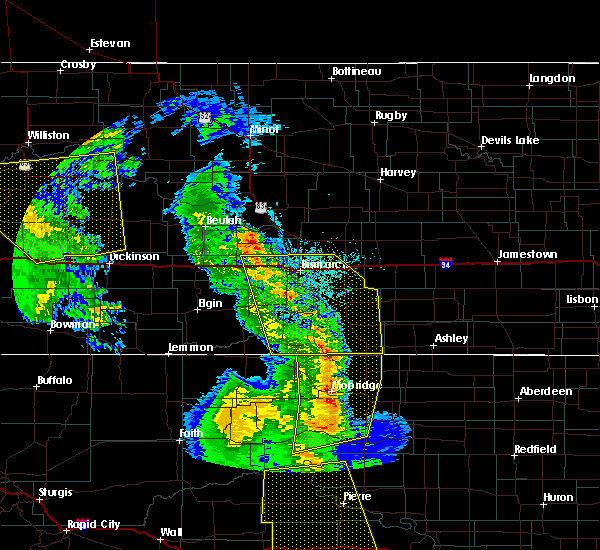 this severe storm will be near, strasburg around 1000 pm cdt. other locations impacted by this severe thunderstorm include kintyre, temvik, hull and beaver bay recreation area. 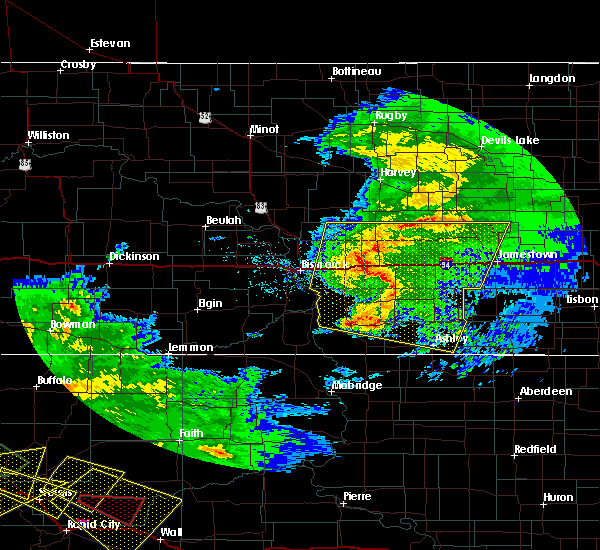 A tornado watch remains in effect until 1100 pm cdt for southeastern north dakota. 6/21/2015 9:34 PM CDT At 933 pm cdt, a severe thunderstorm was located 8 miles southwest of hazelton, or 13 miles northwest of linton, moving east at 45 mph (radar indicated). Hazards include 70 mph wind gusts and nickel size hail. Expect considerable tree damage. damage is likely to mobile homes, roofs and outbuildings. 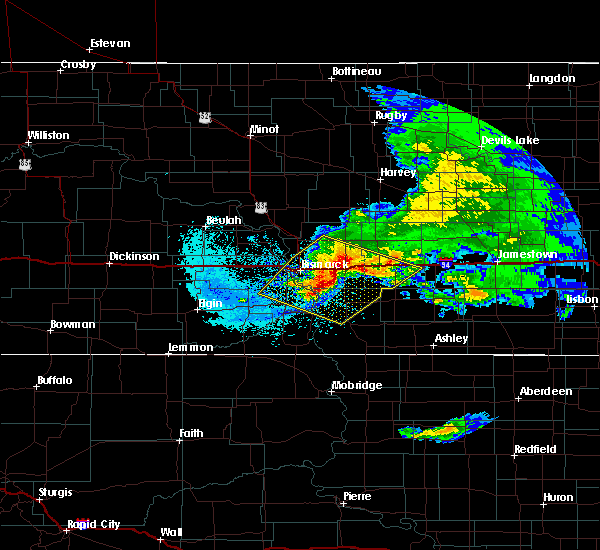 this severe storm will be near, hazelton around 940 pm cdt. linton around 950 pm cdt. other locations impacted by this severe thunderstorm include kintyre, fort rice, hazelton recreation area, hull, huff, beaver bay recreation area and temvik. 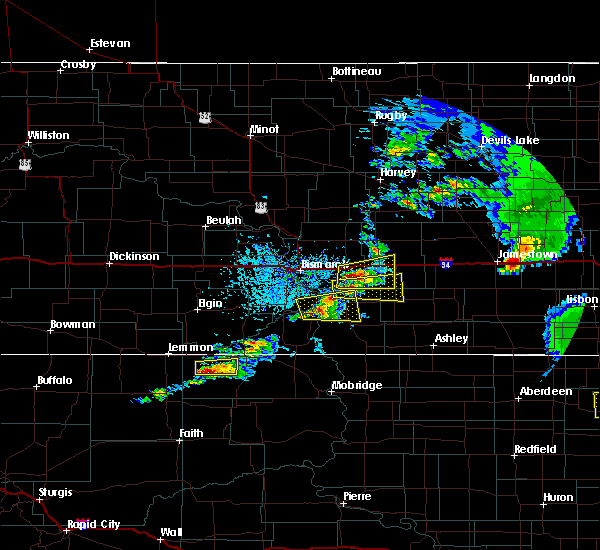 A tornado watch remains in effect until 1100 pm cdt for southeastern north dakota. 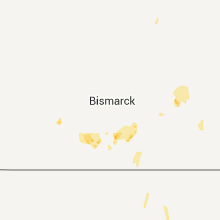 6/21/2015 9:11 PM CDT At 911 pm cdt, a severe thunderstorm was located 8 miles northeast of solen, or 21 miles south of bismarck, moving southeast at 45 mph (radar indicated). Hazards include 60 mph wind gusts and nickel size hail. Expect damage to roofs. siding and trees. this severe thunderstorm will be near, cannon ball around 925 pm cdt. 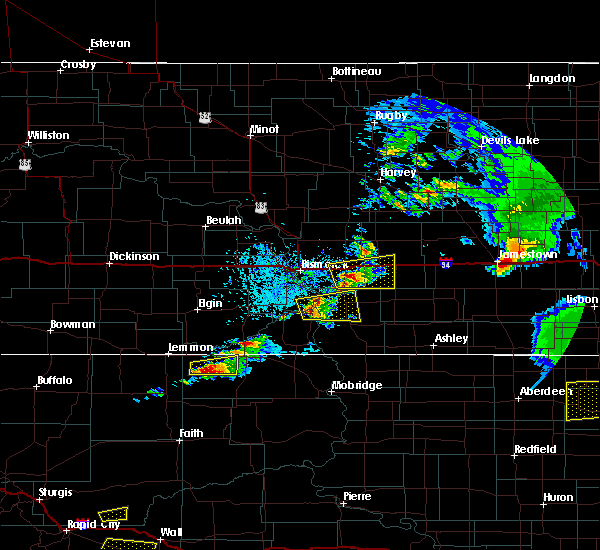 hazelton around 940 pm cdt. linton around 950 pm cdt. other locations impacted by this severe thunderstorm include kintyre, fort rice, breien, hazelton recreation area, hull, huff, beaver bay recreation area and temvik. 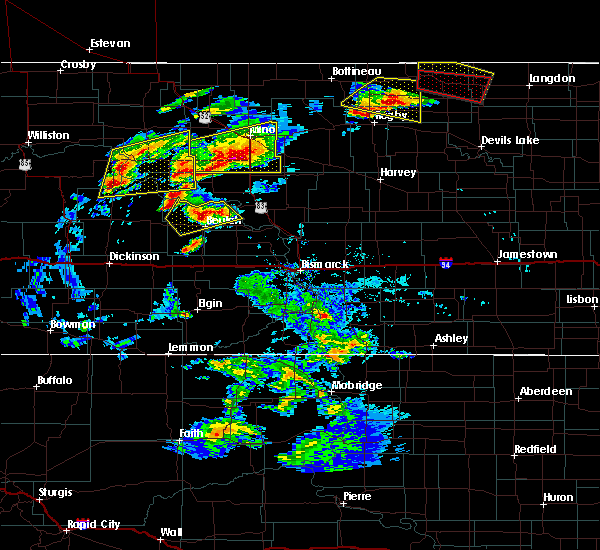 A tornado watch remains in effect until 1100 pm cdt for southeastern north dakota. 6/19/2015 10:03 PM CDT At 1001 pm cdt, severe thunderstorms were located along a line extending from 9 miles north of steele to linton, moving southeast at 65 mph (radar indicated). Hazards include 70 mph wind gusts and nickel size hail. Expect considerable tree damage. damage is likely to mobile homes, roofs and outbuildings. Locations impacted include, linton, napoleon, ashley, steele, medina, wishek, gackle, hazelton, tappen, streeter, sterling, cleveland, lehr, dawson, braddock, lake isabel, driscoll, eldridge, mckenzie and windsor. 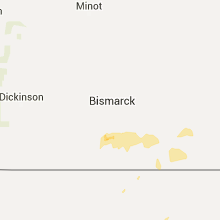 6/19/2015 9:45 PM CDT At 944 pm cdt, severe thunderstorms were located along a line extending from 10 miles south of hurdsfield to 6 miles northwest of linton, moving east at 55 mph. these are very dangerous storms (radar indicated. 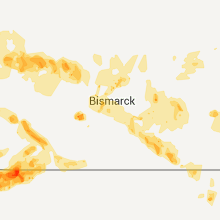 these storms have a history of producing winds as high as 85 mph in bismarck and mandan). Hazards include 80 mph wind gusts and nickel size hail. Flying debris will be dangerous to those caught without shelter. mobile homes will be heavily damaged. expect considerable damage to roofs, windows and vehicles. Extensive tree damage and power outages are likely. 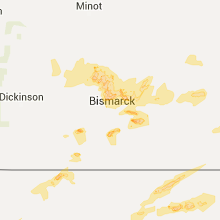 6/19/2015 9:15 PM CDT At 912 pm cdt, a severe thunderstorm was located 11 miles northwest of hazelton, or 20 miles southeast of bismarck, moving east at 75 mph. this is a very dangerous storm (radar indicated. 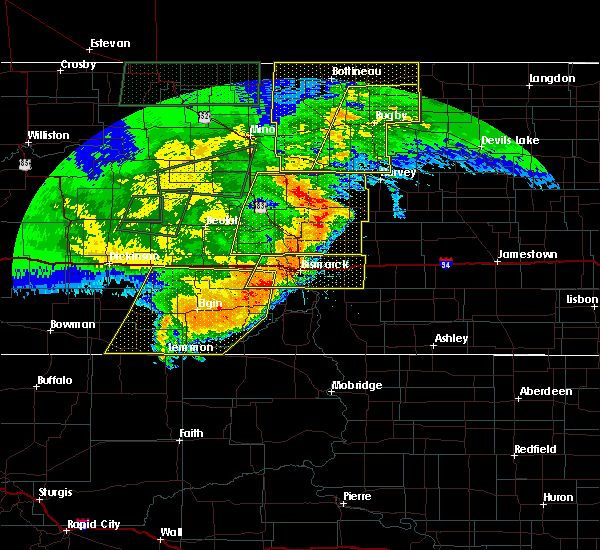 these storms have a history of producing winds up to 85 mph in mandan and bismarck). Hazards include 80 mph wind gusts and nickel size hail. Flying debris will be dangerous to those caught without shelter. mobile homes will be heavily damaged. expect considerable damage to roofs, windows and vehicles. extensive tree damage and power outages are likely. 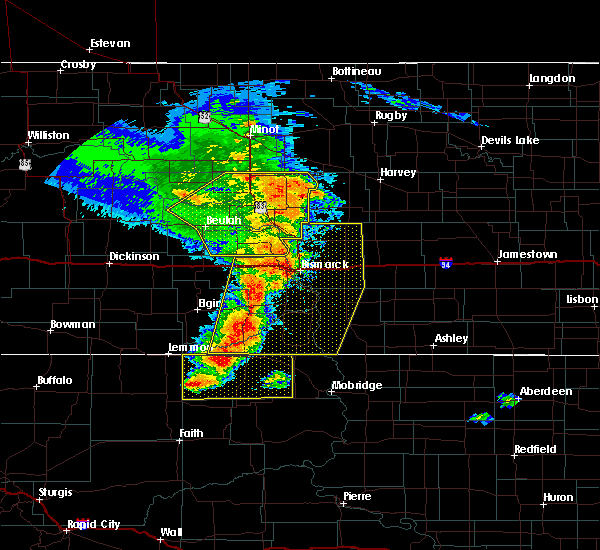 this severe thunderstorm will be near, hazelton around 920 pm cdt. braddock around 925 pm cdt. 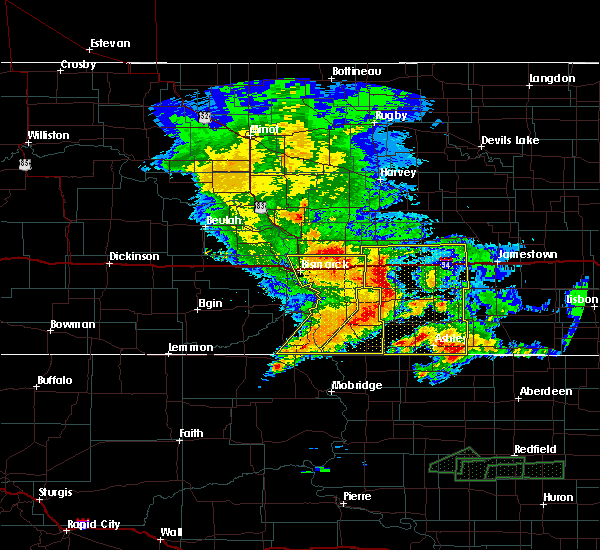 napoleon around 940 pm cdt. Other locations impacted by this severe thunderstorm include huff, kintyre, burnstad, fort rice, temvik and hazelton recreation area. 3/28/2015 8:57 PM CDT A severe thunderstorm warning remains in effect for eastern sioux. southeastern morton. western mcintosh. western logan and emmons counties until 930 pm cdt. 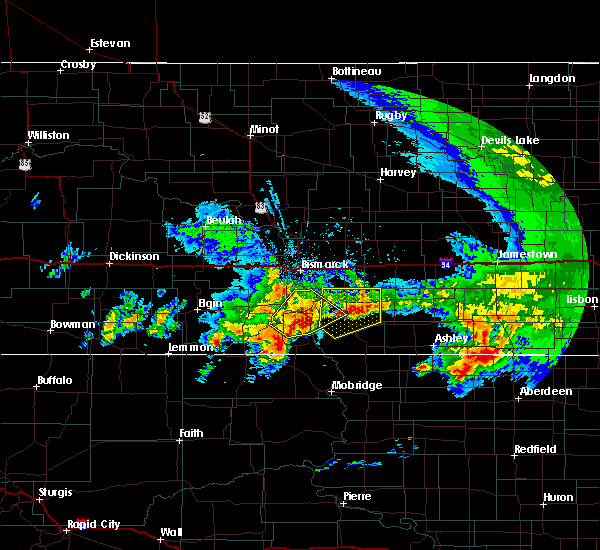 at 854 pm cdt. 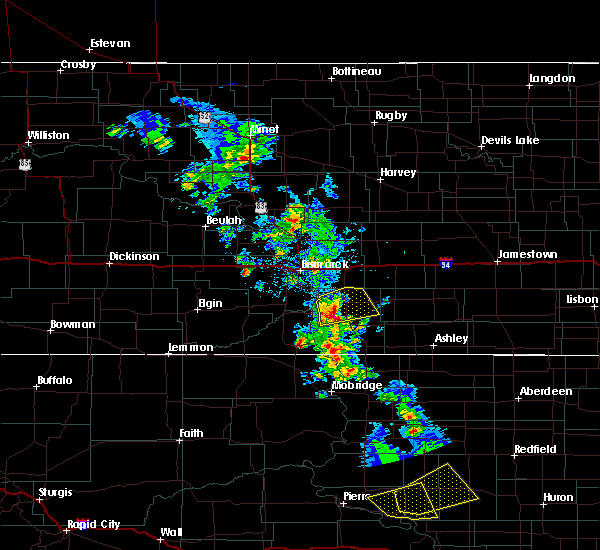 severe thunderstorms were located along a line extending from braddock to 10 miles west of kenel. Moving east at 45 mph. 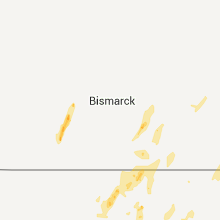 3/28/2015 8:40 PM CDT The national weather service in bismarck has issued a * severe thunderstorm warning for. 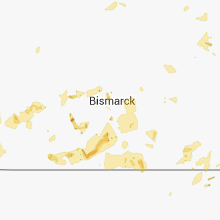 emmons county in south central north dakota. western logan county in southeast north dakota. 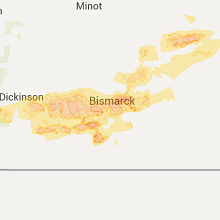 western mcintosh county in southeast north dakota. Southeastern morton county in south central north dakota. 3/28/2015 8:19 PM CDT A severe thunderstorm warning remains in effect for sioux. southeastern morton. 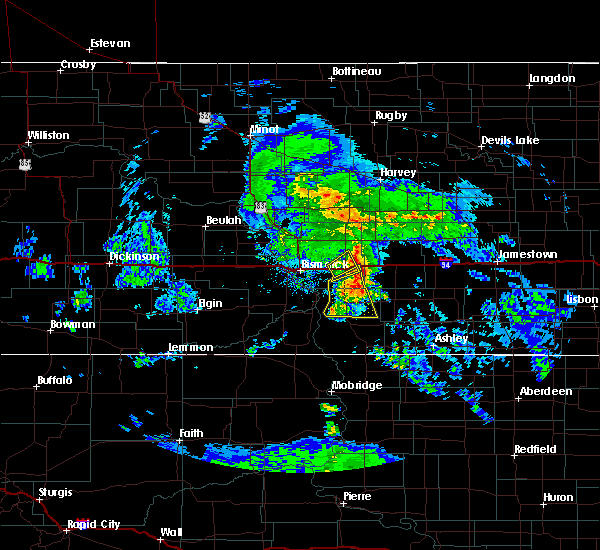 eastern grant and western emmons counties until 845 pm cdt/745 pm mdt/. 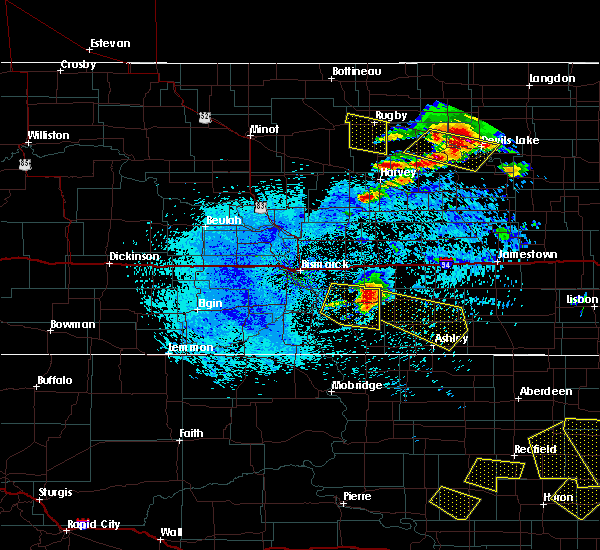 at 817 pm cdt/717 pm mdt/. severe thunderstorms were located along a line extending from st. anthony to 14 miles southwest of selfridge. Moving east at 60 mph. 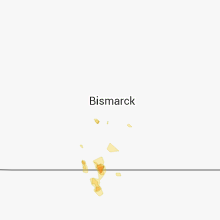 3/28/2015 7:58 PM CDT The national weather service in bismarck has issued a * severe thunderstorm warning for. 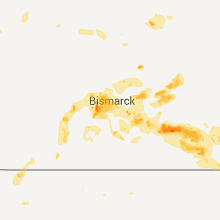 western emmons county in south central north dakota. grant county in south central north dakota. 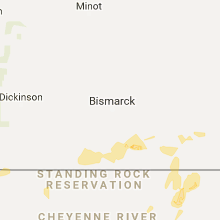 southern morton county in south central north dakota. 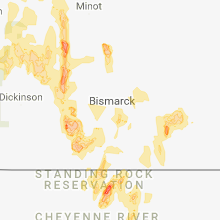 Sioux county in south central north dakota.